Repeat rows 3 – 14 until the scarf is desired length, with last completed row a row 3. Cast off with a row 2. Finish off and weave in ends. Repeat rows 3 – 14 until the blanket is desired length, with last completed row a row 3. Cast off with a row 2. Finish off and weave in ends. Thanks to Camille73 for giving me permission to post her chart of this pattern. This is beautiful. Going to start it tonite!!! Thanks for the pattern. Will also be starting this tonight, Where is the hat pattern? Together would make a lovely gift. How do you end in a row 3 and cast off with a row 2? That wasn’t a clear way to say that. Continue the pattern repeating those rows with a row 3 being the last row of the pattern before the cast off row. Use row 2 for the cast off row. Many Thanks for sharing this pattern. It looks lovely. There are an awful lot of stockinette stitches. Does the scarf roll into a tube when finished? Yes. I didn’t have the scarf in mind when I made the hat. It has to be blocked unfortunately. This is a fabulous pattern. I love the art deco scarf and hat. I appreciate you sharing these patterns and responding to the comments. 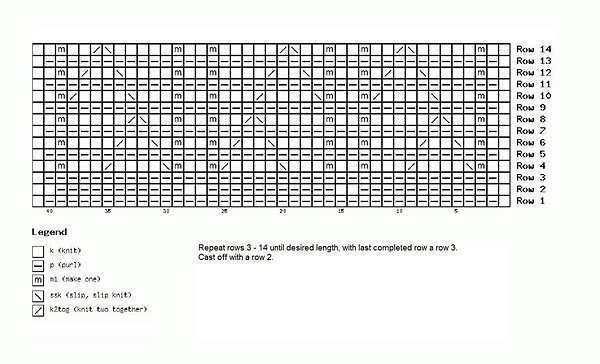 The restatement of the last pattern row (3) and cast off row(2) was most helpful. Thank you. You have amazing talent, Thank you for sharing. 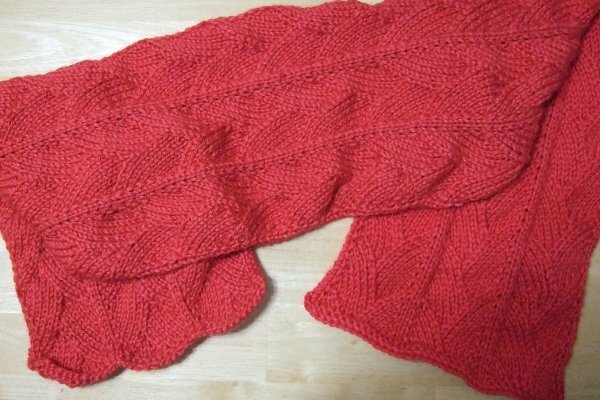 Thank you for sharing this gorgeous scarf pattern! I LOVE it! It becomes a multiple of 26 plus 14. For roughly 40″ wide, cast on 196. Repeat rows 3 – 14 until the afghan is desired length, with last completed row a row 3. Cast off with a row 2. Finish off and weave in ends. Tks for the adapt. for an afghan. It will be perfect, and with the seed stitch borders – hopefully – it will not “curl”. Lovely! Definitely my next project. I am confused about the directions for the blanket. What happened to Row 12? It skips from Row 10 to Row 14. I understand about the odd row repeats. Love this pattern!!! Thank you so much for sharing! Starting on Christmas 2012 now! Hi! Love the scarf….and the matching hat. I’m a fairly new knitter, but even after your explanation for the cast off row, I’m still not sure what you mean. I probably can’t see the forest for the trees! Can you please help this dummy?? Thanks for sharing your talent! No problem. I’m so glad you have entered the knitting world. Continue to repeat 3 through 14 until the scarf is the desired length, ending with a row 3 as the last row you work before casting off. After that row 3, you want to repeat a row 2. I cast off while also working a row, so I cast off while working that row 2. If it rolls into a tube why have such a beautiful pattern and not see it? Am I missing somthing? I typically don’t make scarfs that aren’t reversible and that don’t lay flat. What happened on this is I made the matching hat as a chemo hat, so didn’t think about the implications of the scarf. When someone wanted a matching scarf, I was just sort of trapped with it to match the pattern. Depending on the yarn used, it will block if you wet it and let it dry. It also isn’t the type of pattern that wants to be completely flat, but actually looks quite lovely a little rumpled. Love the scarf. I can’t wait to make one. Also would love to make the afghan using the pattern you posts. Approximately how much yarn would you need to make the afghan. For a 40″ by 60″ afghan, it would take about 40 oz of yarn. I’m a little thick here. How many skeins (or yards) would 40 ozs. be and can other yarn be substituted? 40 oz would be about 2,000 yds. The number of skeins would depend on the size of the skein. These calculations are based on worsted weight yarn. Great scarf, can’t wait to start!!! Love the scarf but I can’t seem to understand the m1 stitch. I pick up the 2 strands of thread between the last and next stitch but I can’t figure out what back loop I knit. I guess I’m the only one who can’t figure it out. Help! Here is a video explaining the stitch. I hope this helps. In making the new stitch (m1), I think only one strand is picked up, not two. Is that correct? Kay – You’re not the only one having a problem with the M1 stitch. I’ve tried several times to complete row 4 and end up with the correct # of stitches – and I haven’t been successful, yet! I’m going to the video now! This pattern looks beautiful thank you for sharing this to us.I’m just learning how to knit/crochet but i want to make this scarf i love the pattern so i’ll give it a try maybe i can make the hat also i hope… Wish me luck. It is really annoying to have to print 7 pages of junk to get your pattern, you should have a printer friendly spot on your stuff, I have done it at least 3 times, won’t do it again! There is a printer icon at the end of the pattern that will create a printer friendly version of the pattern. So many people were missing the printer icon that we decided to move it to the top. I must be stupid but I have read the directions over and over and cannot understand how I can go from 41 stitches to “Row 4″ with an increase of 9 stitches. What am I doing wrong? Perhaps I don’t understand what ssk and M1 are? I thought I did. I looked at other rows and they also show increases. Please help. The number of stitches should remain constant because there is an increase for every decrease. The m1 stitches increase by one stitch and the k2tog and ssk each decrease by one stitch. I’m fairly new to the knitting world, and this is actually the first patterned scarf (Patterned anything, actually) I’ve tried before. Just thought I’d say I love the pattern, but can’t seem to get any further than row 6 before I mess up. I ended up with two spare stitches, and can’t for the life of me figure out what I’m doing wrong. Do you think there are any other patterns similar to this that may be better suited to a novice such as myself? girls!! thank you so much! This is a beautiful scarf! Thank you for posting it. I am a very, very new knitter so I’m hoping I can do this. Beautiful scarf. Will try to knit. This scarf is beautiful. I’m making it for some ladies at work for Christmas. Thank you. I, too think that this is a gorgeous scarf. I fell in love with it when I saw it on allfreeknitting. Thank you so much for your ongoing commitment to offering us free patterns. From Australia. I’m a fairly new knitter and I would like to make this beautiful scarf (thank you!) Can you please explain the second row, K2, Pl1 three times (???) is that it? What about the remaining chains? Thank you for your help and beautiful scarf design! What is in the parentheses is repeated three times, so knit 2 and purl 11, then knit 2 and purl 11, then knit 2 and purl 11. I think this pattern would make a pretty baby blanket also. Are there directions anywhere giving the instructions for a baby blanket? I had plans to make an in-the-round blanket version of it, but just have not had time to make the actual blanket. I added some directions at the end of the pattern for blankets of various sizes. I can copy this scarf. What a beautiful pattern…thanks so much for sharing! Am I the only one confused by the fact that there IS NO row #3? Is this just a typo, and is Row 4 actually row 3? Or am I missing something that everyone else is seeing? Help, someone, please! I really want to try this pattern. So rows 3, 5, 7 and so forth are repeats of row 1. How many seed stitches on each side would you recommend – to keep the scarf from rolling? I only did one in the pattern. I think three would help and still look nice. It will still roll up as a whole just because it is basically stockinette, so if you want it to lie flat, you may need to block it. can you tell me what m1 means in the directions? Want to try some of the scarfs. It is called Shadow Triangles. It is in The Ultimate Sourcebook of Knitting and Crochet Stitches by Reader’s Digest, in the Large Lace Patterns chapter, on page 124. I have found in the past, to prevent a pattern from rolling on the edge, I knit in the back of the first stitch instead of the front and this has worked very well for me. Hope this helps others also. It is. The basic stitch pattern is an old standard that has been around a very long time. Whoa! I finally got it! Had to restart 4 times as I always semed to drop a stich in 4th row. Not sure how that happened but since there were no runs in the piece, it must be happening in the purl row, dropping a stitch that’s an m1 in the previous row. I had to do better.I don’t knit a lot, just once a year around Xmas. This is my first post. Then I read about Heather’s mathematical mind and I loved her instantly. Went back to the pattern. Cut and pasted it into a word doc, landscape layout and BIG with spaces between the rows… and studied it, looking for the “method”, the logic of that complicated (for me) row. I did find some points of reference through the rows: the 1st 3 stitches and the last three, then the 2 sets of m1,k2,m1 that form the “stipes” between the swirls. So I coloured the “phrases”in the rows in the pattern, from the 1st m1 to the 2nd m1 in red, to the next m1 in green and to the final m1 in blue. That helped me to learn the pattern without getting confused along the row. Needlss to say, I started knitting the scarf again then with a great deal more success. I still dropped a few stiches along the way but learned to recognize where I was in the line and instead of ripping out, I made up the missing stitch as discreatly as I could. Yes, I cheated a bit, and i’m not proud of that but I was learning. Not only learning this pattern but re-learning to knit as all I’ve knitted in years has been mittens. The elation that resulted from this excercise was tantamount to a daily workout… for my brain. I now have about 2′ knitted and I’m not dropping stitches anymore. I got it! Whoa, it’s the same thrill I’d get from riding the craziest rollercoaster ride. I had forgotten the thrill that knitting something complicated is. Heather, I love the challenge that your mathematical patterns bring. Thank you so much for your generosity in designing them and allowing us to use them. Row 2s produce the purl bumps on the right side, which doesn’t look as nice. How do you get your Row 2 to look like nice flat knit stitches? Thank you so much!! Mine has those purls on the right side as well. I have them there to keep the edge from curling. You can make it by putting knit stitches there instead if you like. Hi , I hv started the pattern but little confused abt rows , need to do row 15 ?? Or after finishing row14 hv to start direct row 3 ??? Yes, row 15 is row 3. You will repeat rows 3-14 until it is the length you want.